Coming soon! 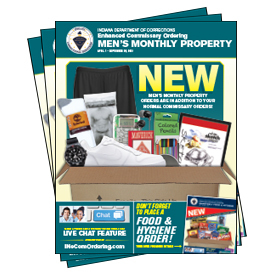 Enhanced Commissary Ordering starts April 1st!!! Check back on April 1st to place your order! 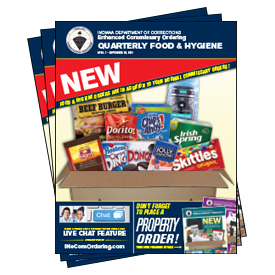 In addition to their normal commissary orders, offenders located in the Indiana Department of Correction Adult Facilities may receive one Enhanced Commissary Food and Hygiene Order up to 30 pounds of product per quarter. These orders can contain any of the approved items that appear on this website. Please see the Policies and FAQ sections for more information on these orders, eligible offenders and delivery schedule. Attention: Offenders located at New Castle Correctional Facility and Heritage Trail Correctional Facility are not eligible to receive Enhanced Commissary orders at this time, please visit www.INinmatepackage.com for ordering options for these facilities. 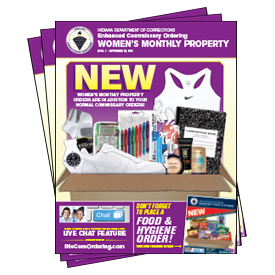 In addition to their normal commissary orders, offenders located in the Indiana Department of Corrections Adult Facilities may receive one Enhanced Commissary Property Order per month. These orders can contain any of the approved items that appear on this website. Please see the Policies and FAQ sections for more information on these orders, eligible offenders and delivery schedule.